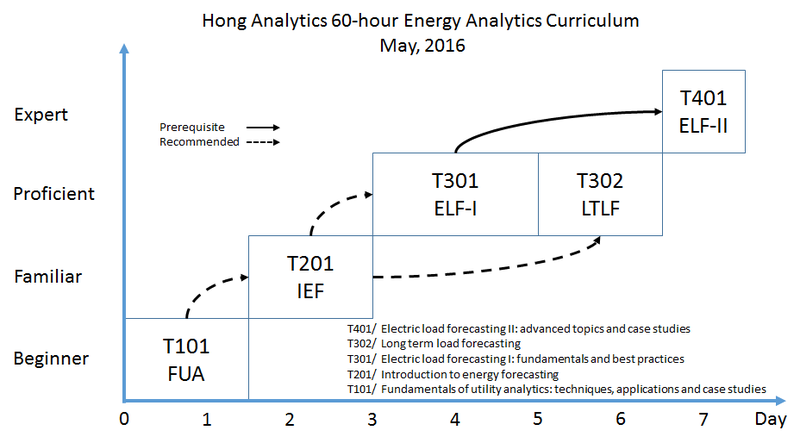 A 60-hour energy analytics curriculum. Tao, can you recommend some training courses I should take? Check out the list of my recommended SAS courses. While the list was put together two years ago, it can no longer address all the needs from my clients. For instance, some clients want to know more about the applications of analytics in the utility industry; some do not have access to advanced analytics software; some need to develop wind and solar forecasts rather than load forecasts; some are interested in the state-of-the-art load forecasting methodologies. If you are new to the industry, analytics, or both, you can start with T101. 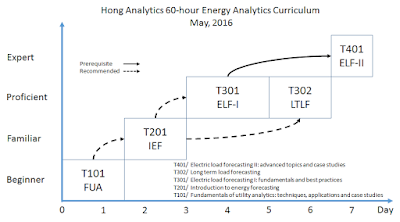 If you are new to energy forecasting, T201 would be a good start. T301 is the flagship course that has accommodated a wide range of audience. If you are a long term load forecaster using MS Excel, you may take T302. If you are looking for the secret sauce, T401 is the level you should reach. Did I forget to develop a master level course? No. Nobody can become a master in 60 hours. One may be able to talk like an expert after completing this 60-hour curriculum. To reach the master level, one has to spend 10,000 hours on the subject. Of course, the BigDEAL would be the #1 choice for energy forecasters! The next offering of Fundamentals of Utility Analytics has been scheduled in Chicago, IL, August 10-11, 2016. Look forward to seeing some of you over there! I am a 3rd year undergrad majoring in Statistics who just decided (this week) that I want to work as an energy forecaster after I graduate. I just discovered your blog, and am so thankful that it exists. Just wondering, as a complete beginner to this field, is this the best study plan I should follow? This post was written 5 months ago, is it still the most up to date study plan? These courses were designed primarily for working professionals who are already in the utility industry or just launched a job in an energy company. Since you are still in school, I would recommend that you start with some papers and books. Check the "recommendations" label of this blog. I couldn't find anything on the recommendations label specifically directed toward undergraduates. I am still unsure of what order I should be doing things. To give you some idea of where I'm at currently, I have taken Calc I - Calc III, linear algebra, probability, and two standard college level statistics courses. What should I do next? Take an economics courses, an optimization course, and a software programming course.